Ashington FC manager Steve Harmison admitted his side were off the pace in the first half of a dour encounter against Dunston UTS at Woodhorn Lane on Saturday. However Harmison thought his side were unfortunate to have a ‘goal’ disallowed during the second half which would have put them 2-1 ahead. “It was a bizarre game in a way where both goalkeepers have made one very good save each and then didn’t have much to do,” he said, “The game was played in front and both goals had a bit of fortune about them. “For the Dunston score, I thought it was a free-kick on our ‘keeper Conor Grant and I’m sure Dunston boss Billy Irwin will be aggrieved with the penalty award we got. “But I’m disappointed that having got back on terms at 1-1, Ben Harmison’s ‘goal’ didn’t stand. He continued: “After the break we were completely different – I thought we were much better. “We isolated Ben [Harmison] a little bit trying to play with three up front but didn’t get close enough to him and the game just petered out into nothing really. “However, over the past seven days, the lads have put a lot of effort in and because of that there were some tired bodies out on that pitch today. 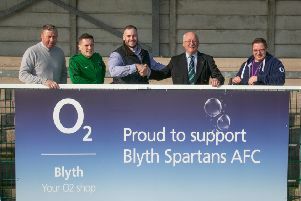 “The energy levels against South Shields were unbelievable and the effort to come back from 1-0 down to win 2-1 on Wednesday at Billingham Synthonia in the League Cup was also commendable. “I think that was why we were lethargic first half and didn’t have the ‘get up and at them’ attitude throughout the game and the fact we have no midweek fixture will do us the world of good because again we have picked up a few injuries. “But we have got to start winning games at home and that was a disappointing aspect today. “James knows Craig is one of our best defenders and implied to us he thought Craig had to play and I think he was probably right. “James has come out of the team under no fault of his own – he and Wayne Buchanan have been excellent. “They were outstanding against South Shields and the three goals we conceded were not defensive goals. For Saturday’s trip to Newton Aycliffe, Shaun Henderson and Ryan Bell are definite non starters whilst fitness reports will be required from Craig Scott, Ben Harmison and Ben Sampson. “We have got to keep an eye on Ben Harmison because we are running him into the ground,” added the boss.